The Hublot Big Bag has long been one of T3's favourite watches, and now it's been given the Android Wear (or should we say, Wear OS) treatment. 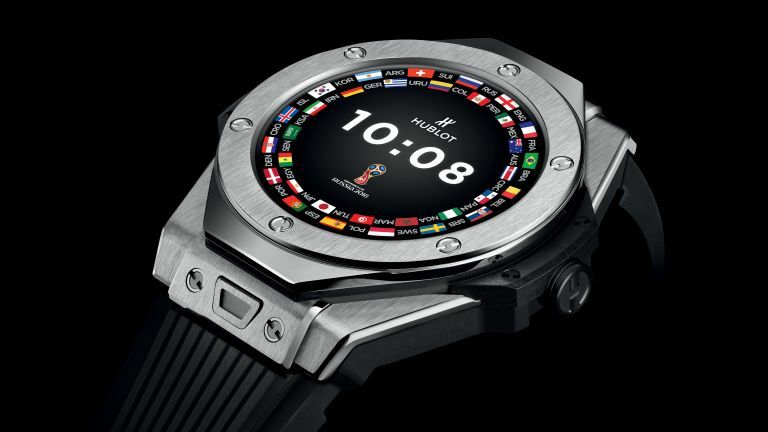 This limited edition smartwatch has been created as part of Hublot's partnership with the FIFA World Cup, allowing football fans to instantly connect with every decisive second of the match. The piece started when FIFA asked Hublot to create a customised watch for the referees which they can wear on the pitches during the matches. Hublot designed this connected watch, the watch maker's first, running Google's Wear OS with some unique World Cup features built-in. Firstly, footie fans will be able to customise the smartwatch with a series of “fan” dials, each in the colour of the participating nations. The Big Bang Referee 2018 FIFA World Cup Russia (it's full name) will also send you notifications 15 minutes before a match kicks-off, as well as yellow and red cards, player changes. Of course, the Big Bang Referee will vibrate and display the word "GOAL" instantly every time one is scored. During the match, the dial shows the match statistics including the score, number of cards, names of goal-scorers, player substitutions and match time. As you can see, the piece has all the attributes of the iconic Big Bang range, including an angular titanium case, a bezel decorated with 6 H-shaped screws, and a Kevlar insert. In terms of size, its a 49mm case. We think it looks great, and while it's clearly a connected watch, it's still got that Hublot Big Bang DNA. The Big Bang Referee 2018 FIFA World Cup Russia is limited to 2018 pieces. You'll be able to purchase one from 1st May at Hublot retail stores, it's expected to cost 5000CHF (around £3,700).